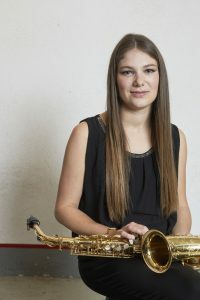 Simone Ehinger got her first saxophone lessons at the age of nine, from Frank Schüssler at the “Städtische Musikschule” in Friedrichshafen. She was the recipient of four first prizes in the German competition “Jugend musiziert” and received a scholarship from the German foundation “Deutsche Stiftung Musikleben”. From 2005 till 2009 she was a member of the Symphonic Youth Wind Orchestra Baden-Württemberg under the direction of Prof. Felix Hauswirth. With this orchestra she toured Korea, Scotland, Portugal, Ukraine, and Spain. In 2009 she started her studies with Arno Bornkamp at the Conservatory of Amsterdam. A year later in 2010 Simone got awarded with the “Kulturförderpreis der Stadt Friedrichshafen”, the cultural price of her home town. During the winter semester 2012/2013, Simone was part of the Erasmus exchange program with Vienna and continued her studies under Lars Mlekusch. In 2015 Simone got supported from the Dijkstra-Visser Fonds, which is a port of Prins Bernhard Cultuurfonds. Simone attended numerous master classes, most importantly with Claude Delangle, Christian Wirth, Vincent David, Daniel Gauthier, Jean-Marie Londeix, and Christian Lauba. In 2016 Simone is finished her master degree in saxophone and chamber music at the conservatorium van Amsterdam. Since 2015 Simone Ehinger is part of the team of the International Saxophone Masterclass. She’s responsible of the organizational part of the course.